Captain Shaw was born in Basking Ridge, NJ, and attended Ridge High School. He was Captain of the varsity lacrosse team and the student government president. After graduating in 2002 he attended the United States Naval Academy. While at the United States Naval Academy he played club lacrosse and was the 6th Company Commander. 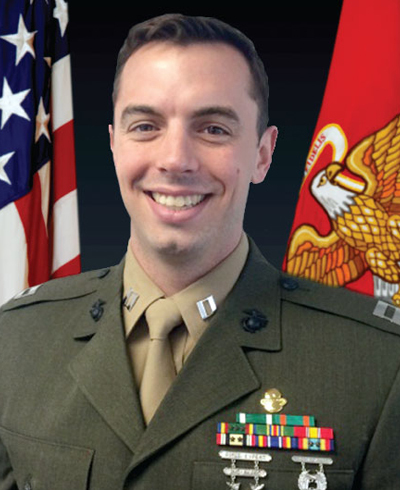 He completed his degree in Political Science with a Bachelor of Science and upon graduating in 2006 he accepted a commission as a Marine officer. Captain Shaw was assigned to Echo Company at The Basic School (TBS) and graduated in January of 2007. Following graduation, he immediately began training at the Infantry Officer Course. In April 2007 he graduated from IOC as an Infantry Officer and was assigned to 1st Battalion, 7th Marines. In May 2007 he was assigned as the Platoon Commander for 2nd Platoon, Alpha Company. During August of 2007 he deployed in support of Operation Iraqi Freedom to Al Anbar Province, Iraq. Upon returning from this deployment Capt. Shaw was reassigned as the Weapons Platoon Commander, Alpha Company. He deployed in this capacity to Iraq again in 2009 where he served as both the Weapons Platoon Commander and Company Executive Officer. Upon returning from OIF he was reassigned as the Weapons Company Executive Officer and later as the Battalion’s Assistant Operations Officer. After completing the Battalion’s pre-deployment training cycle for the 31st Marine Expeditionary Unit he was reassigned to 3D Marine Division in Okinawa, Japan. In July 2010, Capt. Shaw was assigned to 4th Marines, 3D Marine Division and soon took command of Headquarters Company, August 2010. The company deployed to Camp Fuji, Japan, for training in October 2010 and again in February 2011, to Thailand in support of Exercise Cobra Gold. In May 2011, he was reassigned to the Jungle Warfare Training Center on Camp Gonsalves, Okinawa. In May 2011, Capt Shaw assumed duties and responsibilities as the Operations Officer and Deputy Camp Commander for the Jungle Warfare Training Center. He subsequently attended and graduated from the Malaysian Army Jungle Warfare Operations Course in PULADA, Malaysia. After completing his tour at JWTC, he was reassigned to the Individual Training Course, Marine Special Operations School. From May 2012 to March 2013 Captain Shaw was a student at ITC and the MARSOC Team Commander’s Course. Upon completion of both schools he was assigned to 2D Marine Special Operations Battalion where he served as a team commander. Formal Schools attended: The Basic School (TBS), Infantry Officers Course (IOC), Combat Hunter, Marine Corps Martial Arts Instructor Course, Malaysian Army Jungle Warfare Operations Course, Expeditionary Warfare School (EWS) (distinguished graduate), MARSOC Individual Training Course (ITC), MARSOC Team Commanders Course (MTCC), SERE, and the USMC Combatant Diver Course. Capt. Shaw’s personal awards include: Navy and Marine Corps Commendation Medal, Navy and Marine Corps Achievement Medal, Navy Unit Commendation, Navy Meritorious Unit Commendation, National Defense Service Medal, Iraq Campaign Medal, Global War on Terrorism Service Medal, and the Sea Service Deployment ribbon (with two stars).